A call came to our hotline at 5:20 pm from Wyrallah. 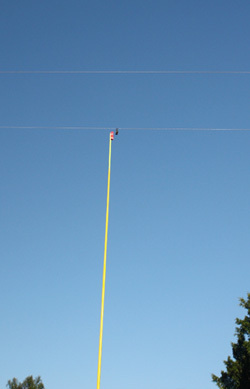 A flying –fox pup was alone on a power line. By this time, Country Energy staff had left the depot. They logged the call for the morning's crew. I worried all night about the little one. There were many phone calls between Sue-Ellen (the lady that had called the seen the little pup on the power line) and me. Sue- Ellen said the pup was chittering back to the squeaky farm gate every time it was opened. Country Energy technician, Steve, called at 7:30 next morning to say he was on his way to the Wyrallah farm. I arrived at the property one minute before Steve. The baby bat looked so tiny. Steve taped a mummy roll onto the end of the hotstick and much to our relief, the pup transferred herself to the mummy roll within a few seconds. 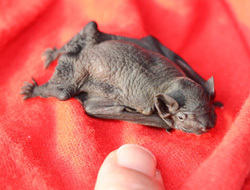 It was a 24 day old female grey-headed flying-fox pteropus poliocephalus . She was named Ellie after Sue-Ellen, and was in good shape considering her 36 hour ordeal without her mum. She will be raised by WIRES for the next 12 weeks and released in February with other orphaned flying-foxes. Going to the beach one would expect to find sea shells and possibly have the pleasure of spotting something in the water such as a Dolphin, one would not expect to see a small Swamp wallaby joey. Local residents at Flat Rock beach quickly retrieved the cold joey from the surf and rushed him to Lennox Head vet clinic where veterinarian Evan examined the joey and treated him for shock and possible pneumonia. He came in to care with WIRES and is now settled in with another 7 joey's. He will be released back to the wild in about 6 months time when old enough to fend for himself. 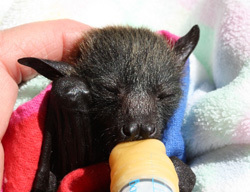 WIRES bat carer Will was called by the hotline to go to Pearce’s Creek for a Flying Fox rescue. It turned out to be a microbat pup, not yet furred, only 4 gram and about 3 cm long. 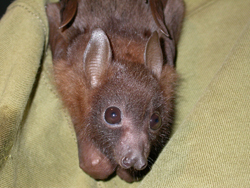 “Brosnan” is a Gould's Wattled Bat chalinolobus gouldii and will be in care until big enough to join others of his kind. 3 Welcome swallow chicks were found still alive after falling from their nest at Repentance creek Hall. Another 3 did not survive the fall. They are approximately 2 weeks old and will be in care with Alicia for a short time as they grow very quickly. 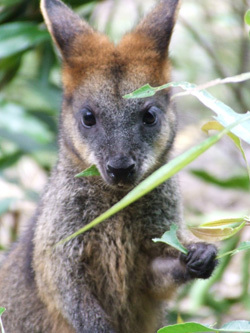 Thank you Mary for calling WIRES after finding this juvenile Swamp wallaby in his dead mothers pouch. 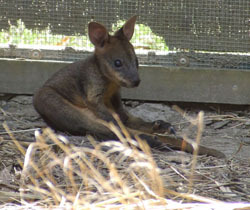 He is seen here having a rest after a little run around in the nursery pen with 7 other juvenile wallabies currently in this WIRES care facility. 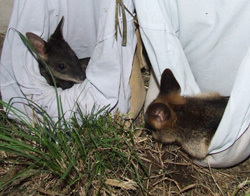 All will be released together as a family group when they are old enough to fend for themselves in the wild. Meantime he spends a lot of time in his substitute pouch, occasionally coming out for a run as seen here. Seen here 4 months after arrival , now independent only coming close for his bottle once a day. 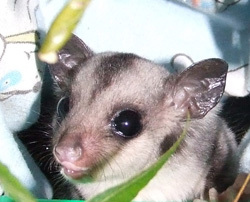 Merlin the Mountain Brushtail possum is currently in care after being found with his dead mother on a property at Federal. He is approximately 5 months old, and will be in care till he is about13 months old. Seen here a couple of days after being orphaned. 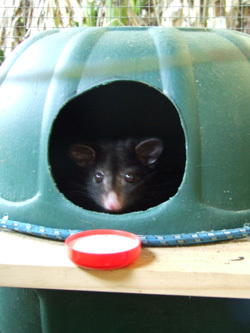 Possum has now moved in to a larger enclosure with his own possum box. He spends the night climbing the branches and logs within his enclosure, learning important skills needed when the time comes for release. 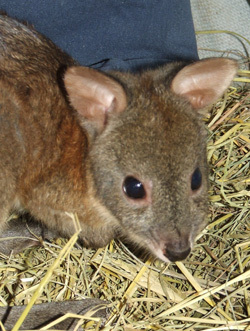 This Red-Necked Pademelon joey came in to care after his mum was killed by a dog. 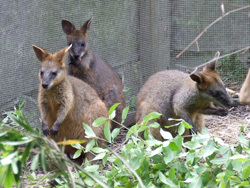 This is unfortunately not an isolated incident, many Wallabies and Pademelon's die due to both domestic and wild dog attacks. This little fellow is approximately 5 months old, still dependant on mum, so he will be in care for 6 months with others of his own kind and eventually released back to the wild. 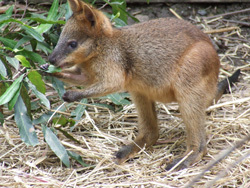 Our little Pademelon is growing steadily, seen here 6 weeks after arrival. 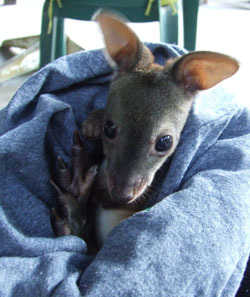 He now spends quite a lot of time out of his pouch interacting with other joey's in care. Magpies are breeding as everyone is sure to know by now, with birds actively defending their territory and young. It is confronting to be swooped and sometimes hit by an angry bird, but our reactions can often exacerbate the problem. Recently in Casino, an adult male magpie was set upon by a group of children throwing rocks. It was struck by a rock which badly broke its wing and caused severe bruising. The children returned the next day, armed with sticks and rocks and the intention of “finishing it off’. One child also climbed the tree in an attempt to get to the two chicks in the nest. Luckily for the magpies, local residents rescued the injured bird and called WIRES. 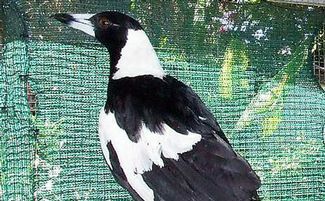 The residents told WIRES’ carer Melanie that even though they weren't’t big fans of the magpie’s swooping, they understood he was only protecting his family. This magpie is now in care with Melanie. He has been to the vet, his wing was strapped and he was given course of antibiotics. After two weeks the swelling and bruising on his shoulder and body is still showing. He will be in care for at least another week. Meanwhile his mate will have to find enough food for her hungry chicks on her own, and defend their territory from other magpies. It is distressing for WIRES carers and local vets, already stretched to the limit caring for injured wildlife, to have to deal with deliberate attacks like this. It is cruel and only provokes the birds to become more aggressive. It is also a punishable offence to deliberately harm our native wildlife, and large fines apply. It is only for a couple of months during the magpies’ breeding season that brings about such protective behavior. Given events like this attack, it is no wonder some birds become so aggressive. In most cases a simple change of route or carrying an open umbrella will avoid the problem. For the rest of the year magpies serenade us with song, eat bugs from our gardens and lawns, and peacefully go about their business. Please be patient for a little while longer. This morning I took the magpie back to his tree. He called repeatedly to his mate but she was not there. He flew up to the nest and looked inside but it was now empty. Barry from the next house told me what had happened. A week ago he heard a commotion early one morning and saw many magpies. They hunted the female magpie from her nest and she did not return. One of the chicks disappeared and the other fell to the ground and died. The female magpie could not defend her young and territory without the male, so they have now lost their tree to other magpies. The male magpie can fly but is nowhere near as strong as he once was, so the chances of him finding his mate and regaining his territory are slim. It is a very sad ending to all the suffering this poor bird has gone through. 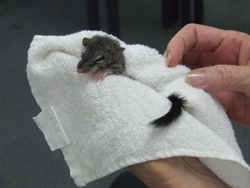 WIRES carer Leoni currently have 3 juvenile Brush-tailed Phascogale joey's in care found by Emily at White Swamp. Thank you Emily for calling WIRES, all 3 joey's are doing well and will be released as soon a they can fend for themselves. 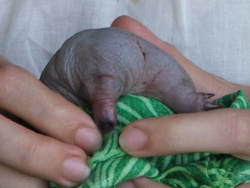 Judy & Kelly rang the WIRES hotline late at night saying they had picked up a tiny Echidna puggle. 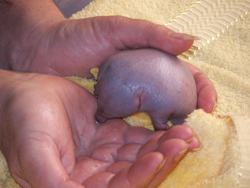 Due to their swift actions they were able to collect this 178g hairless pink puggle off the road. 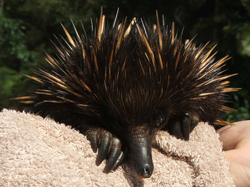 The female echidna had dropped her young when she was frightened off by a car. An extensive search was unsuccessful in finding the mother echidna who ran off into nearby bushes. Neighbors are keeping an eye out for her in the chance that we may be able to reunite mother & baby. The puggle was taken into care by Eric & Sharon who stabilised and assessed the little one for injury. A bruised nose was causing the puggle some grief, but no other injuries were evident. The puggle’s temperature was stabilised during the night to a cool 24 deg C, before feeding and cleaning could commence the following day. A temporary pouch was set up to house the puggle and keep it snug. The puggle was then transferred to WIRES vet nurse Vicki, who is able to provide the sterile conditions required for rearing such a tiny creature. Echidnas become more active in Spring and more come into WIRES care during this time. 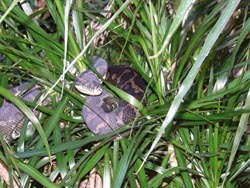 This 985g dispersing juvenile was found at Alstonville with multiple injuries. There was evidence of some old injuries and some recent ones. It seems this little one was having a run of bad luck. The grooming claw on one rear leg is missing and several claws on her other hind foot are missing. Many of her spines are broken and she has a small cut on her snout (beak). A course of antibiotics and some TLC with lots of good food and safe housing should see this young one on her way to recovery. One week after coming into care with WIRES she is now recovering and eating well. There are some signs that her grooming claw is growing back. The good news is that she is becoming very active and her nose is starting to heal. She has now been moved from intensive care to an outside enclosure and will soon be released. 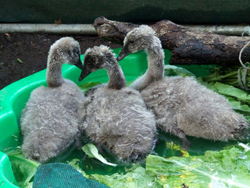 Steve called WIRES after finding these 3 cygnets (Black swans) on their own by the road a fair way from water. He waited with them for 1/2 hour, but no sign of parents. One had a small wound under its neck. Maybe a fox or predator caught their mother? They will be in care for some time before being released back to the wild. Thank you Steve for calling WIRES. 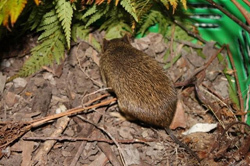 This little female juvenile Northern Brown Bandicoot was found in a chicken coop with no sign of siblings or parents around. Being much to young to fend for herself she is currently in care with WIRES carer Alicia and will be returned to the wild when old enough to fend for herself. Thank you Lisa for calling WIRES. Richard called WIRES when he found a Swamp wallaby in trouble at Federal. This wallaby had in fact been reported to WIRES a few days earlier, but had disappeared before we were able to rescue the animal. 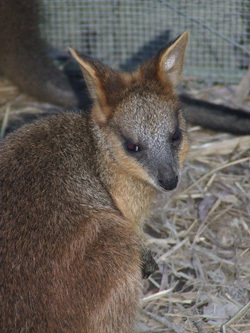 As it turned out the wallaby had a fractured skull, and was humanely euthanased. 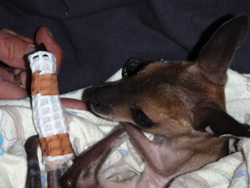 A tiny 4 month old joey was unharmed in mums pouch and he is now in care with WIRES. 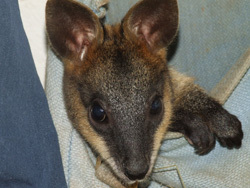 He is kept at a constant temperature in a substitute pouch until he grows some fur, he will then join other joey's in an outside enclosure and will eventually be released back to the wild in about 10 months time. Joey seen here a week after arriving in to care. 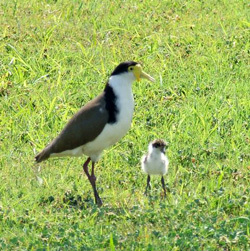 Masked Lapwings (or Plovers as they are commonly known) are often seen here on the Northern Rivers. They have adapted readily to manmade habitats such as sport fields, parks and improved pastures. They nest in a slight hollow on the ground, and as they are so exposed the parents vigorously defend their eggs. The male plover will fly loudly at the intruder to scare them away, and even though they possess a spur (actually a pointy thumb) on each wing, they are mostly bluffing and very rarely make contact. They sometimes pick the most inappropriate places for their nest sites. In WIRES we have had reports of them nesting on medium strips on busy roads, in the middle of driveways, atop flat roofs and even right next to the final hole of a Mini Put-put course. The eggs hatch after three weeks and the parents lead to chicks off to forage for food. 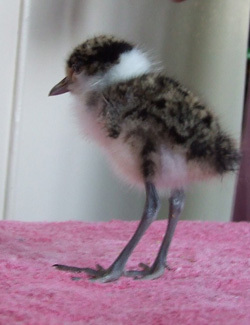 The chicks are little fluff balls on long legs, and tend to wander quite far from their concerned parents. 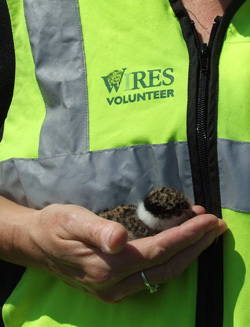 Recently WIRES rescued a newly hatched chick. It was very cold and distressed when it came into care and needed some intensive treatment to regain its strength. 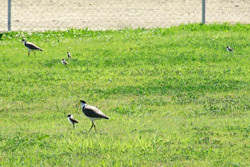 As we were unable to find its parents, we searched until we discovered a pair of plovers with chicks of a similar age. As I approached the family, father plover raced over, calling threateningly. I slipped the chick onto the ground, and straight away the father bird rounded it up and herded it over to the rest of the family. It happily joined in and the mother plover seemed none the wiser that her family had just grown. If you do have plovers nesting near you, please be patient as it is only a few weeks until the eggs hatch. Children are always delighted to see the fluffy, cheeky chicks. Even though winter is currently here, snakes are still about on warm days, as can be seen here a Coastal Carpet Python making it's way up to a sunny spot on roofing iron. 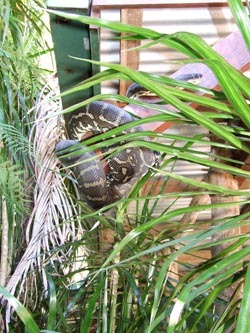 Let the snake go on it's way, it is unlikely to cause any harm, it is merely recharging in the sun. 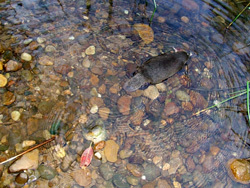 WIRES became involved with the relocation of this Platypus, found during major road construction. 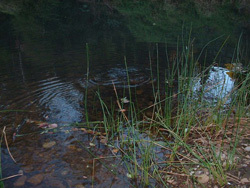 Unfortunately the habitat that this platypus had been living in was destroyed, and there was no option but to relocate her to a new location. Fortunately she had not been injured and was in good condition, so we were able to release her within a few hours of being found. 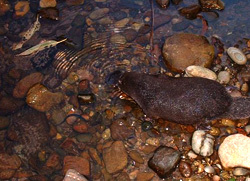 There is very little knowledge of these animals, and relocation has not been studied, so we can only hope that giving her a good habitat location with plenty of food, knowing that there are other Platypus here, will give her the opportunity to live the remainder of her life in peace. 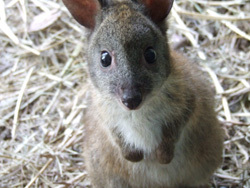 Thank you Norma for rescuing this little 5 month old Red-Necked wallaby after her mum was killed by a motor vehicle. WIRES Macropod carer Bess is currently caring for her until she is a bit bigger, she will then be transferred to another carer with outside enclosure and other wallabies in care of similar stage of development. Her broken foot is healing and her plaster is due to be removed next week. She had had regular vet checks in the last 5 weeks ensuring her plaster is not too tight as she she is growing. She will be released back to the wild when she is approximately 14 months old. 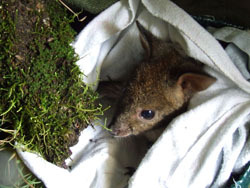 In recent weeks WIRES NR have rescued a number of Pademelon joey's from Wilson's Creek and Huenbrook area. All have been human friendly which is extremely unusual even for young animals. One joey jumped on a fellows lap, another was seen grazing alone for quite some time, and the land owner simply walked up to the joey and picked it up. Others did not fare as well, one became the victim of a dog attack, another had a parasite load too large for it to cope with, both died shortly after being found and brought in to care. 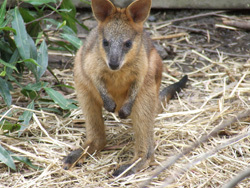 If anyone in that area are raising these joey's please contact us when you rescue the next one, and certainly before you release it. 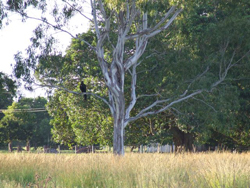 Early one morning in January a man walking his dog noticed a Wedge-tailed Eagle sitting on a fence post next to Casino cricket pitch. He was able to walk close to it and it did not fly off, so he contacted WIRES. It was a juvenile bird under one year old and was extremely weak. It could still fly, but only at a height of a couple of meters and tired easily. It showed no injuries and was most likely starving. Unfortunately we were unable to catch it, so we decided to leave it a dead rabbit. It watched closely while the rabbit was placed on a fence post and after a number of hours came down to eat. Over the next two weeks it remained in the general vicinity and ate a total of six rabbits, gradually regaining strength and resting higher up in the trees. 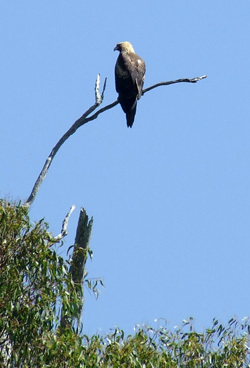 Today the eagle was sitting on the highest branch in the tallest tree. It watched me for a little while, then launched itself from the tree and soared in large circles above me, getting higher and higher. I suddenly noticed another eagle flying with it and together they circled above, gaining altitude until they were dots in the sky. Tears sprang to my eyes as I watched these magnificent birds. I like to think the young eagle was showing me how well he could now fly. 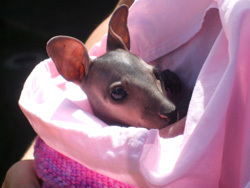 WIRES would like to thank Margaret and Nimbin police for their help in rescuing this Swamp wallaby joey. 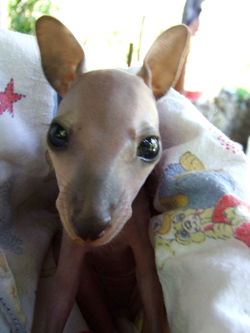 His mum was severely injured by a motor vehicle at Nimbin early in January, she was humanely euthanased by Nimbin police, who also took the trouble of transporting the tiny joey to Lismore after the incident. 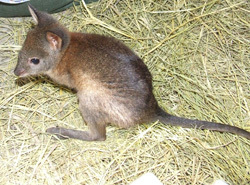 The joey was taken in to care by WIRES macropod carer Sherryn, he has thrived in care, seen here 4 weeks after arrival, now starting to grow his fur, and being interested in the world around him. He will be in care for many months yet, we will keep you updated on his progress. Joey is doing well, seen here with one of his new friends another swamp wallaby a little older than him. 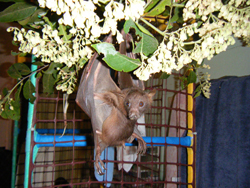 The Casino flying-fox colony is currently hosting an influx of visitors. Tens of thousands of Little Red flying-foxes have arrived, as they often do at this time of year. Normally the Casino colony has Black flying-foxes and Grey-headed flying-foxes which vacate the site during winter. Little Reds are a smaller and more nomadic species, following the flowering patterns of native trees for nectar and pollen which is their main diet. They are important pollinators of trees such as eucalypts and fly further into inland Australia than the other species. These smaller flying–foxes are more active, excitable and vocal than the other species. Their presence is being noticed because of their large numbers and their roosting on both sides of the river, swelling the colony beyond its usual area on the Southern side of the river. In previous years, the Little Reds stayed in Casino only for a few weeks then moved on. Little Reds present wildlife carers with extra challenges when they come into care. After they have been rehabilitated, usually from barbed wire injuries, they have to be released into a roost wherever their species currently are which might mean transporting them some distance. Six little Reds have just been transported from Sydney this week to be released with their kind in Casino. This has meant a leapfrogging operation involving bat carers from several groups. The things we do! 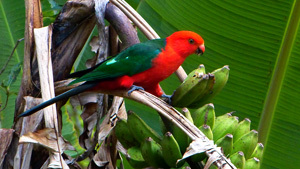 This pick (Gerald) is of a sub-adult male Little Red, taken by Toni Mitchell from NT. 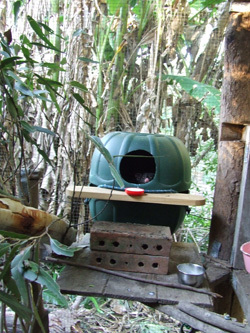 It shows how flying foxes invert to toilet. Notice how well rounded his tummy is; sign of a well fed bat. Looks like he has just been fed and wants to make room for more! As we shelter from the storms, our native wildlife tries to do the same. Birds hide as best they can, sheltering in their nests, protecting their chicks. We hear branches break and fall in the storm, old trees come down. Many of these old trees are just like apartment blocks for native animals. 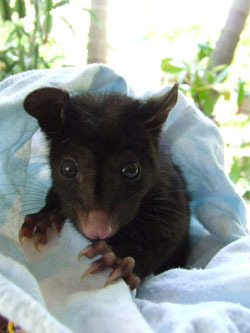 They may house owls, possums, gliders and parrots all of which rely on hollows to live and breed. 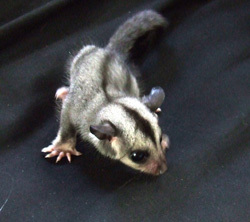 This juvenile Sugar Glider came in to care a couple of days after a severe storm, most likely the little glider was orphaned as her family drey may have been destroyed. She was joined shortly after by a juvenile Squirrel Glider having suffered the same fate, and they will now grow up together and eventually be released back to the wild. 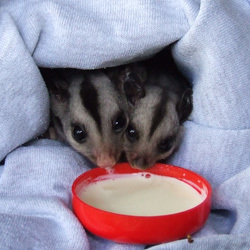 These Gliders do well together in care, even though in the wild they would not share facilities. In care juveniles benefit by each others company, when they are released they will seek out their own kind.